Nike has a habit of picking its players up—with tribute ads—after major injuries. 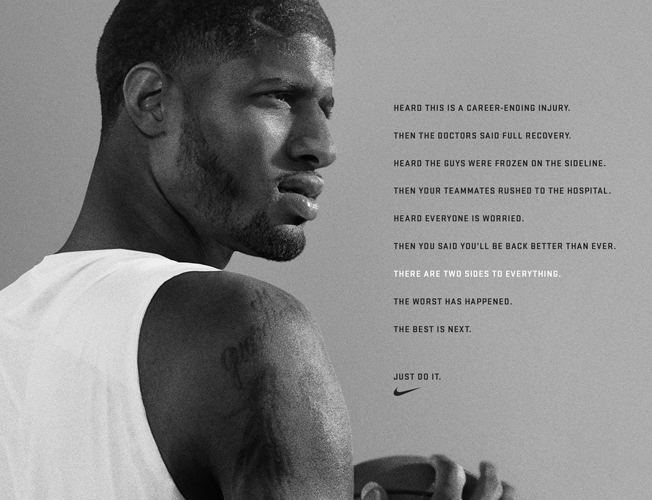 The brand did so with Kobe Bryant in 2013, and it has now released the inspiring ad above for Paul George following his gruesome leg injury a week ago. The theme of the Wieden + Kennedy ad is the dreadful uncertainty—short term and long term—that followed George's open-leg fracture. But the final lines of the ad put the 24-year-old Indiana Pacers star firmly on the path to recovery. "Without the setbacks, the comebacks aren’t as sweet," the brand wrote on Twitter. George hasn't acknowledged the ad directly, but on that score, he certainly seems to agree.